The purpose of this post, is to introduce the basics of parameterized classes, upper and lower bounds and variance subtyping in Scala. Scala is a statically typed languages similar to Java and C++. Most of those concepts have been already introduced and commonly in Java with generics and type parameters wildcard. However Scala added some useful innovation regarding sub-typing covariance and contravariance. API designers and library developers are facing the dilemma of choosing between parameterized types and abstract types and which parameters should be invariant, covariant or contravariant. Like in Java, generic or parameterized type have been introduced to overcome the limitation of polymorphism. 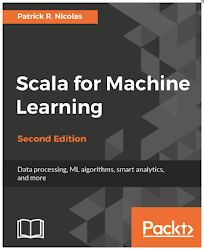 Moreover, understanding of concept behind the Scala type system help developers decipher and fix the occasional compilation failure related to typing. Let's consider a simple collection class ,Container that adds and retrieves an array of items of type Item as follows. The client code can invoke the add (lines 5 & 10) and retrieve (lines 7 & 11) methods passing an array of elements of type Item. However passing an array of type SubItem inherited from Item (line 2) will generate a compiling error! // invariant in type T..."
The Scala compiler throws a compiling error because the class Container does not have the adequate information about the sub type Item into SubItem in the add method (line 9). The invocation of the retrieve method, passing an argument of type SubItem generates also a compiler error. Scala provides developers with upper bounds and lower bounds subtyping which is quite similar to the type variance available in Java. can be processed as a 'producer' of type Item. The notation provides the Scala compiler that any type inheriting Item should be allowed to be passed as argument of the add method (lines 2 & 7). can be processed as a 'consumer' operation of type SubItem, in the retrieve method (lines 4 & 8). Container[T] is a covariant class for the type Item as argument of the method add. The method retrieve[U] is contravariant for the type SubItem. Scala has a dedicated annotation for unvariance 'T', covariance '+T' and contravariance '-T'. Using this annotation the container class can be expressed as follow. - Univariance: No rule applies.